Love the marketing sauce on the article again though. Acting surprized tier 9 and 10 got a bigger contribution after 9.18... Really nice to get spoken (manipulated) to like an 8 year old. Love it. I really do not underdstand: they complain about having "too many" Tier X and Tier 9 tanks to allocate, so that a lot Tier 8s has to be taken in the infamous 3-5-7 template. As bottom tier. Constantly. For ever. 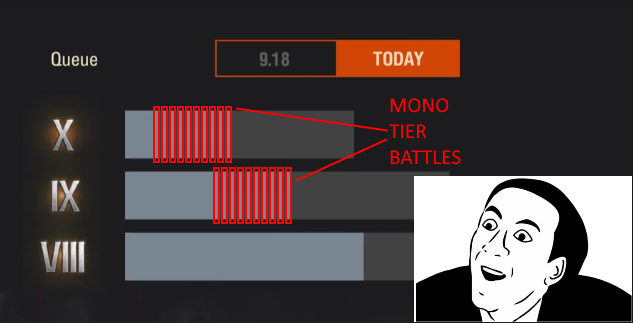 Sarsasm aside, why didn't they push more mono-tier battles!? It easily offsets and removes any number imbalance, without introducing disadwantages. Win-Win scenario: I play my tank against comparable opponents, there is inherent balance, leave some 5-10 or 3-5-7 every now and them - don't fix a new algo, rather tune it. If a shop has a surplus of red apples, they simply lower the price or sell bigger bags with more red apples inside, period. They will never-ever sell 3 red apples, 5 yellow and 7 green together.. but wait, oh Tanks Bundles! That's another huge chapter by WG. you, with your logical and reasonable solution, you are not welcome here! one would also think that the surplus on any tier would invite WG to create a Frontline or Grand Battle mode for the affected tier. wouldn't mind a 30v30 on tier V, VI, VII or IX. but WG still has to learn that players who don't spam their premium rounds and don't hold a premium account all the time still create more revenue than those who stop playing completely. IN SOVIET RASHA, SUPPLY DEMANDS YOU! Why do people keep asking for skill based MM? You had it like 3 times, and it is called Ranked battles aka the most cancerous MM that has ever existed. Ranked battles is implementation (kind of) ELO system, system created for chess, not for team games, so is bad. Look at my proposition, and thing about it. But you may not agree, but you are representation of 0.1%, so you are not person WG should listen if they want big healthy player base. Players who hate the most that the battle is lost because of a few "Bad Players" should try and play better in order to win the battle. Using xvm has led us to the point where some players decide to quit or yolo, because they calculate that there is no point playing the game since the team is so bad. And for the skill-based mm; it does not work. No one wants to play all the time to their maximum skill level. Yes, challenging games are good every now and then and you can learn something from them but if games are all the time at the max level you can play, the fun disappears. Skill based events like ranked battles are enough if you want to play with the people with same skill set (if you have played these, you know that battles have very different feeling). Let the random battles be random. "And for the skill-based mm; it does not work" how you now it? Players who play only meta tanks, and have all unlock tanks, and with top skills saying skill MM it be bad idea, yeah, only for them. But should WG look at top 1% or at 99% of players? If your team are full with campers, any MM will not help you to win. I hear this from heavy tank players but please realise that currently 9/10 battles with 3:5:7 matchmaking I am bottom tier (tiers II-VI). So I tend to go into battle in tanks such as mediums or TDs that have no armour, and in the case of a TD no turret. There is no advantage in using a tank whose main/only clear advantage is view range and an accurate gun in brawling. The annoying thing is to see top tier heavies camping, expecting the bottom tier mediums to push, presumably, I guess. I am fairly sure I have lost all battles in which top tier heavies camped. But I think that is down to skill and therefore skill-based matchmaking would fix it, i.e. if the enemy heavies were equally brain dead or noobs and also camped. The failure of 3-5-7 was obvious from launch. I wonder how many players this screw up cost WG. To me it really does not matter if when I am in a tier 8 tank there are 3 tier 10s or 4 or 5. The ONLY important thing is will there be a comparable number of games where I will be top tier and meet tier 7 and 6 tanks. Right now that does not happen very often. Five tier 9s and me again at the bottom with Ten tier 8s. You can play all evening and maybe just maybe you will get 1 game where you are top tier and see some lower tier tanks. That's 1 game in maybe 20 or 30 games as bottom tier. No wonder premium ammo is on the increase. Now its true in the previous MM you could often end up in a mismatch where the tank opposite outclassed yours. You might be in a fairly average Heavy vs a superheavy. A KV5 could meet a Defender or whatever. So when you were playing a stock tank there were games you did just fine because for every bad game where you faced a better tank or were bottom tier. There was an equal number of games where you were top tier. Thats great when you are trying to do missions too. Deal Take and Block 12k Damage is a bit easier when you have tier 8 tanks bouncing off your Tier 10 than when a JP E100 or an FV 4005 are not about to punch right through your armour . More Bots and Robots - MM is worse than before. How WG can still produce such a mess?????? Sure. And when you are top tier in your t8, your teammates just siting somewere near own base or runing away when more than 1 enemy in range. That happening for me 80% of games as top tier. Something need to change, thats true. I have all the games lost. There is no point in playing this game. This update is terribly bad. 8 (EIGHT) months ago they promised that everything will be in front of us. Now, new term - probably "few months" again! Replace +/-2 with just +/-1. I just solved the MM PUZZLE AND MYSTERY THAT YOU'RE WORKING SO HARD FOR YEARS NOW. Best idea. Going back to Blitz for a while. Will visit WoT on occasion. Waiting for new MM. Oh yeah, be sure to sell lots of tier 8 premium tanks while I am away. The more OP, the better. Put the Object 279 Early on sale, also.. I prefer to spawn as a red player, hehe. Or purple if you use that setting. I don't think I've ever seen a thread complaining about queue times here, but I have seen plenty of threads about poor tank matching, rollovers and poor skill balance between teams. That's because the queue times are short if you increase queue times you see threads complaining about it. As you used to with how long tier 10 queue times could be. Any FPS titles for one, League of Legends... World of Warcraft PVP. They don't mind/care because it's part of the game and encouragement to improve and be more skillful. Complicated diagrams,not real problems etc...…. The real problem is that some tier 10 tanks are real monsters because of constant powercreeping,more like tier 11 vehicles. And they are matced to tier 8 tanks that cant actually pen them even from the sides. If WOT is trying seriously, MUST stop +-2 matchmaking and use ONLY +-1 matchmaking. If there are too many 10 or 8 tier vehicles for the matchmaker let the most of them play in same tier matches and the rest can easily match with +-1 matchmaking. That's not MAGIC its just commonsense. Edited by darkman231, 08 February 2019 - 01:35 PM. I just love this statement in your article. Wargaming, when are you going to wake up to the fact that most players would rather wait a bit longer in the queue, if it meant they would get into a fairer battle. People say this... until they get long queue times. There is truth in that. However, I feel waiting times are mostly an issue late at night, after midnight. Also being bottom tier in 3-5-7 MM encourages me to camp, not be more skillful. It does encourage me to train my crew and buy premium ammo, there is that, but I still tend to camp and I avoid getting as much involved. I can only say as someone who used to wait 5 minute+ for wowp games before bots, or 15 minutes queues in LoL for the ranked battles to match people at the rank I was at. I cant speak for "most" or "all" players but from my perspective the trade off of longer queue times for +1 / -1 MM would be worthwhile. +2 / -2 MM should be dead and buried, the imbalance between the -2 and +2 is far to big, even "special ammo" doesn't fully balance it. There are too many overtuned vehicles and too many undertuned / powercrept ones to make +2/-2 MM truely viable. I wonder why Frontlines is so popular, I imagine a part of that is balance being single tier only. I can't imagine it would be half as popular if it was a 3 tier spread. Having stated the above I'll still be happier not being bottom Tier 75% of the time if the new MM works. Instead of removing this abomination of a template or make it the least probability one and make it 5-10 variants that will get all ppl actually a chance to have some fun in games and chance against top tiers. Edited by Szatanshow, 08 February 2019 - 02:19 PM. The changes in 9.18 were to address other issues from the players about the MM and the games they saw, it created new issues, but doesn't mean it was a mistake. Definition of mistake - an act that is misguided or wrong. Exactly what the 9.18 MM is. It may well have cured a few issues with the previous MM but it created a whole lot more problems. I'm guessing if WG ran a poll on which MM players prefered 95% of us would say pre 9.18. We also know from the CC meeting at Tankfest that there was meant to be an algorithm in 3/5/7 mm to stop players from being constantly bottom tier. This wasn't added so I would say that was a massive mistake. I would have more respect for WG if they actually came out and admitted they made a mistake rather than try and gloss over it with corporate PR nonsense. ... unless you balance the teams by the players' abilities/skills (at least for the high tier tanks or even only for the Heavy Tanks), good players vs good players, bad players vs bad players, etc. The thing that the players hate the most is the lost battles because of of a few Bad Players. I would like this, even if I wait 30-60 sec to enter a game... I dont want to enter a game in 5 sec and lose 10 min in bad team.